I have an online mum’s group through Facebook who’ve been absolutely wonderful from my pregnancy and beyond. Quite a few of us are into sewing and other crafts so we formed a bit of a spin off group to talk craft. As part of our new group, we’ve set ourselves monthly challenges. February was a zip. Zips aren’t overly challenging for me in that I’ve made many an article of clothing with azip, there was one type of zip I hadn’t tackled though… you guessed it, the invisible zip. 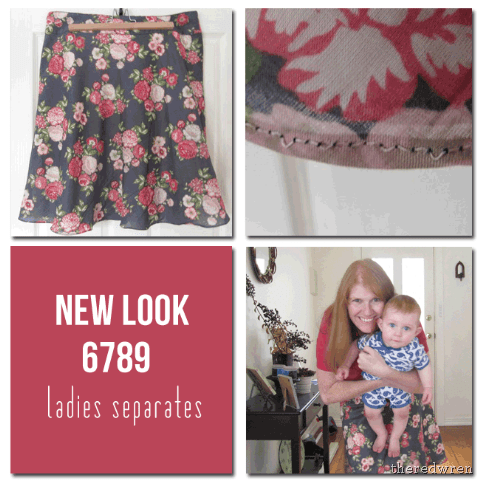 For my challenge I took on New Look 6789 changing out the dress zip for an invisible one. This skirt is really simple, a front, back, and four piece yoke. The main pieces are cut on the bias which gives a lovely drape, although it does use more fabric. I used a cotton lawn with poplin for lining as the lawn is completely see through. This skirt wasn’t the intent for this fabric, I had planned to make a dress, but given I’m still wearing heavy duty feeding bras with unsightly straps a skirt was more practical. I cut a straight size 16, which was rather generous on my behalf and next time I will make a 14. It’s supposed to sit below the waist, but I wanted it to work with the cropped cardigan in the photo above so it needed to sit higher. A smaller size will add a bit more definition to my waist. The invisible zip proved easy once I realised what I was doing. It isn’t finished particularly well inside, but I’ll know exactly what to do next time. I wasn’t overly pleased with the way the yoke attaches. From the outside it looks nice, but on the inside I had to add some twill tape to the facing as it wasn’t long enough to fold and stitch to the inside seam. I tend to use smaller seam allowances than the pattern states so it surprised me that I was so short on seam allowance. I’ll experiment with a different way next time. The hem. I’ve taken a nice close up of the hem as it’s my first ever hem using the rolled hem attachment on my machine. As you can see, something is out of whack with the tension and I forgot I had cream threaded in the bobbin, however, in day to day wear it won’t be overly noticeable. I do love how easy the rolled hem is! Aside from the tension issues it really does look nice. In conclusion I will be making this again as I have piles of floral fabric to use up and the skirt is simple enough to dress up or dress down. I must get to my zip now the dress has been attacked!